I am tired of my sorrow. Aren’t you, the reader, ready for me to move on from it? The question is neither rhetorical nor literal. The question is shameful. Shameful, how is that? The question implies that the author (me) considers the reader to be in a state of consideration of the writer. The very essence of the question is full of the self centered entanglement which is a common secondary condition of a grief-filled state. In other words, or more plainly written, it is difficult to think outside of oneself, when the one-self is hurting. The pain inside is ever encompassing of the soul, it clouds the view of the outside and angles the lens toward the infliction. The last time I wrote a blog post was May 27, 2014 and I haven’t wanted to hear my inner voice since then–I still don’t, though at this moment I am having a hard time ignoring it. Quite frankly, I am exhausted. I am struggling as result of jet-lag, returned this week from a foreign land, and the time difference has my sleep cycle completely turned around. Consequently, I’m tired and my defenses are down. In this past month and a half I have thought of writing. 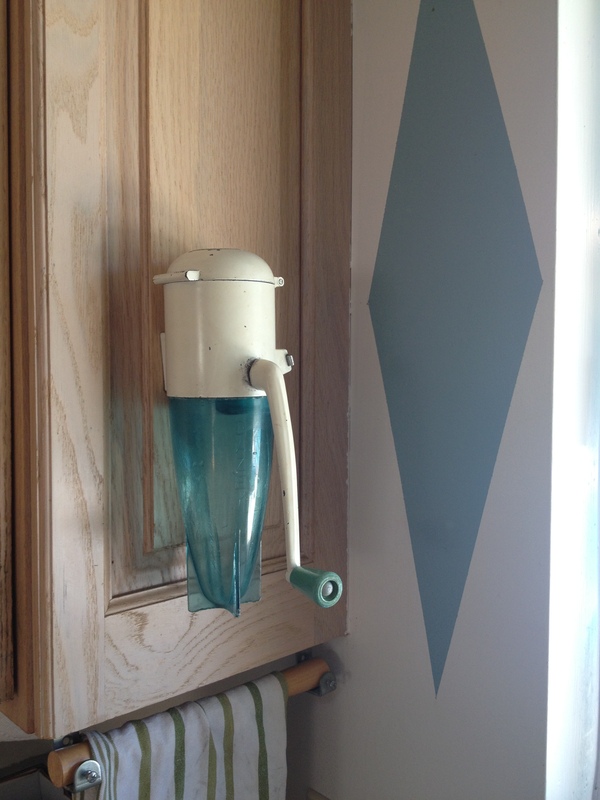 I thought of a blog post when I went into one of our kitchen cabinets to put something away and found the 1950’s rocket-shaped ice crusher we bought for our son when he was a teenager. We have one ourselves and he grew up loving it. At about the age of 15 (or so) he announced his desire to have one for himself for his future home/life. So my husband and I kept a lookout for one for him every time we would pop into an antique shop. We did eventually find an exact copy, though the color scheme was different from our black and white model, as was customary in the 1950’s. His rocket-ship, ice crusher is iconic robin’s-egg blue, translucent style. Crushing ice, space aged style. I pulled the saved item from the cupboard and showed it quizzically to my husband. Thankfully, my ever loving spouse has learned to read my mind and he gave me an answer without having to hear the auditory version of the question. What do we do with this now, this additional reminder of our hopes and dreams lost? Well without conversing on the matter, we both decided it was more hurtful to have it saved away for the day that would now never come, so Brian removed our black and white model and in its place, in honor of the son we love still, hangs the robin’s egg blue. That was a blog post I didn’t feel like writing at the time it happened. As I sat at the computer to translate my feelings, I couldn’t abandon the thought of how heavy my sorrow is for me, and how I don’t want to continue to share its burden. Yet here I am sharing. And why? I don’t know, and perhaps the answer is as simple as, “I can’t sleep.” I think, too, I haven’t had the strength yet to offer encouragement to others. And encouragement for this road of life is what we need most. Lamenting with me over and over again is brutal–exhausting–stagnating. And it is the stagnation that keeps me from creating works at the level I inwardly hope to achieve. And yet, in the suffering is a profound beauty–a blossom–a light. Today I had such a wave of memories flood over my soul. Memories of my son’s childhood, memories we shared together. When memories flood in, their goodness is always overshadowed by the cessation of the hope of tomorrow. Not my tomorrow directly (though most definitely, indirectly) but by my son’s tomorrow. True, his tomorrow is infused in a glorious, peaceful eternity, but it is grief from our (my) loss of which I write, and so we will not confuse the matter by focusing on the heavenly realm–funny how my hope is in Heaven and my faith hinges on me spending my eternity there, but having my loved ones attain it before me is not something to which I favor–the paradoxical side of living. …sorry, I became distracted. The beauty within my sorrowful day was that of the simple gesture of kindness from my husband. My daughter had a routine doctors appointment today and I was to accompany her. I announced an hour ahead of the scheduled time that I would meet her there, as I intended to arrive by foot. Her appointment was with her pediatrician, my son’s pediatrician, the doctor who stood by Cole’s side from his earliest days as an infant to his last days on earth. I was already emotional, flooded by memories of summers past so what the heck, a trip to the doctor would be no big deal. And by walking, I would have time to get my emotional self together. About 5 minutes into my departure I hear a loud noise coming up from behind. I knew the sound well, a skateboard. I turned and there was my husband, Brian. My love who loathes a walk, especially a long walk, especially in the heat of the day; all of which were exactly what he was facing by being by my side. He reached me and got off his board, took my hand and walked with me as I cried. You know what? I haven’t stopped crying all day and now it is after midnight. Oh to be at a place where I can offer you, the reader, a more positive message. A message of “go for it” and “be all you can be!” How I would love to uplift rather than invite you into my sorrow, again and again. How I would love to selfishly be above it myself. Above the hurt of loss. But I am not there yet. The desire is sparked, to be sure, though the follow through is lagging a bit behind.